Street food – it’s all the rage. Which is an invitation for all kinds of foreign dishes to hit London as, let’s face it, Britain doesn’t have a street food culture. One might invoke our national obsession with the weather as an explanation for this. One might also invoke the weather as the reason to why a lot of this foreign “street food” is being sold in cafés rather than on the streets. Yalla Yalla (1 Green’s Court, Soho) is a tiny little café that serves up Beirut “street” food where squeezing around the wooden tables is an achievement in itself. One wall is lined with cushion-filled bench and small stools provide seating for the people opposite. Be prepared to be cosy. 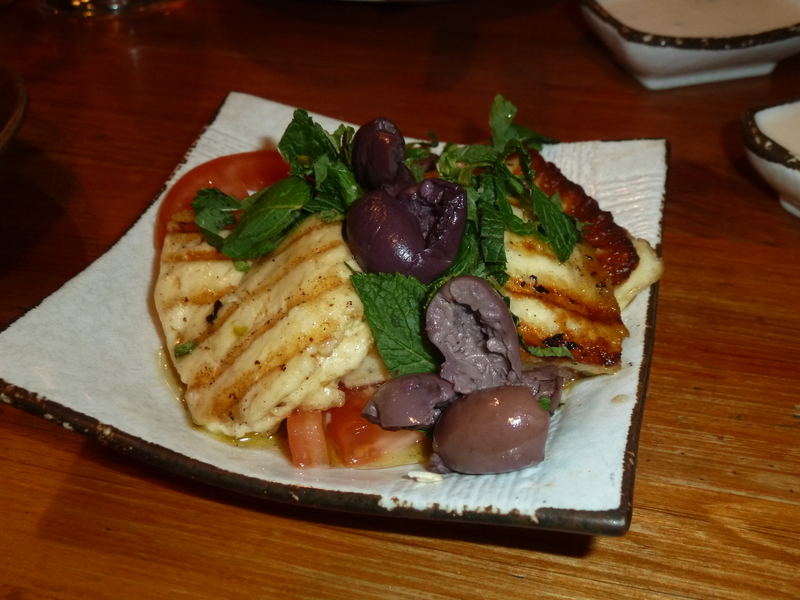 Halloum Meshoue – grilled halloumi cheese with tomatoes, black olives, fresh mint and olive oil. The mint provided a refreshing contrast to the saltiness of the halloumi. And it’s hard to go wrong with halloumi. Mmm. 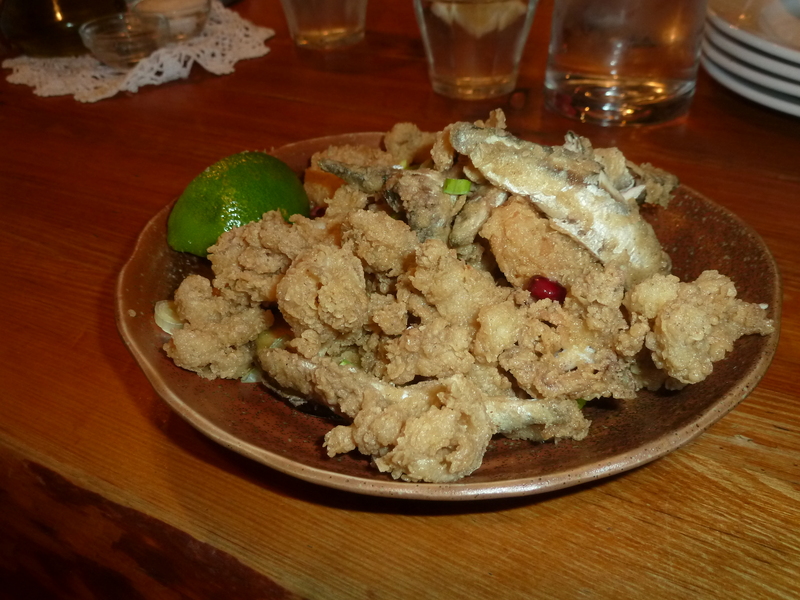 Makale Samak – deep fried calamari, white bait and tiger prawns with spring onions, crispy aubergine and chilli minted greek yoghurt. The batter was fairly light, crisp and well-seasoned. Overall, it was pleasant but not outstanding. 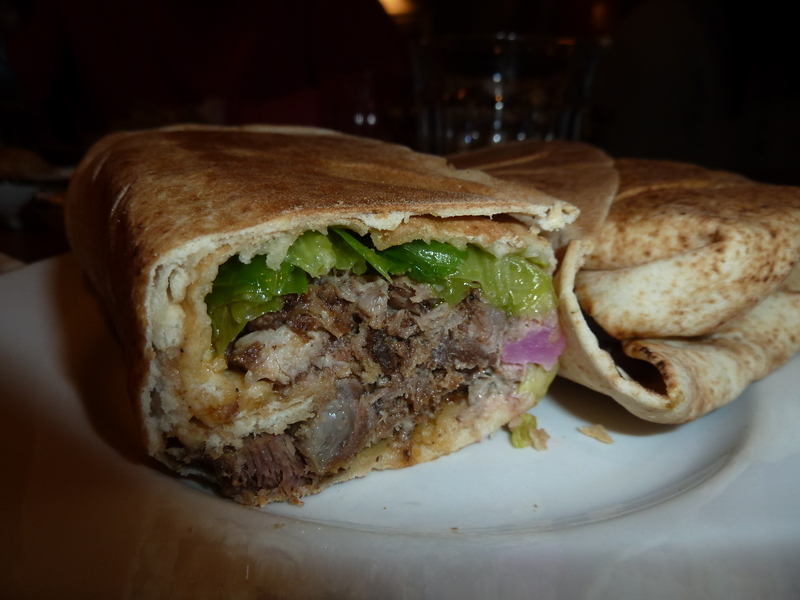 I took the Lamb Shawarma (£4.50) – slices of marinated lamb, sumac onion, pickled turnips, tomato and tahini sauce. It was so succulent and flavourful. And at a bargain £4.50, I thought life couldn’t get any better. Then I attacked my sister’s Chicken Shawarma (£4.50) and realised that… yes, life could get better. The wrap was full of a fantastic garlic sauce that basically meant I had to eat half her wrap. I’ve been wistfully thinking about this chicken shawarma ever since. Highly recommended. 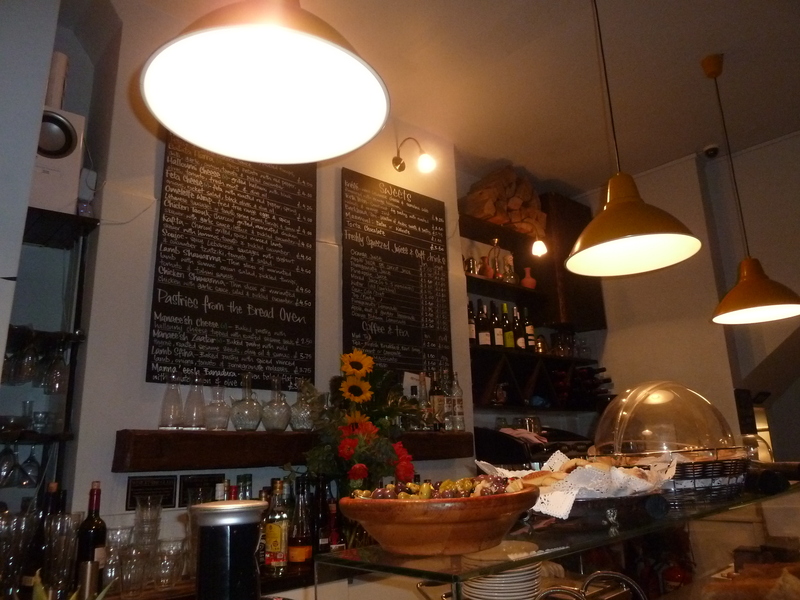 Yalla Yalla 4/5 – Cute and cosy café with reasonably-priced and very tasty food. It’s a winner. When: Various, see website here.